The other day, I posted on the idea of “widgets” for writers. Here’s an example: a double-widget focused on character development. Over the last few weeks, I’ve been taking a break and reading up on some of the subjects I need to know more about for the remainder of the book I’m working on. Namely, about The South Sea Bubble, early Georgian-era brewing and gin distilling equipment, theory, and practice, and the history of alchemy. Mercury, representing the enduring, but transmutable, part of a thing which is purified through alchemical procedures. This is interesting because there was also an idea in Renaissance alchemy that an alchemist had to engage in alchemical work in order to achieve a self-transformation that imbued him or her with the capacity to actually perform the highest works of alchemy, including the creation of Philosopher’s Stone, which after all was not used to “turn lead into gold” but rather was (by many alchemists, at least) understood as a catalyst that facilitated and accelerated a natural process of purification that they believed all matter–including metal–was undergoing anyway. What’s tantalizing about that is how central in Western fiction it is that a character must change, under pressure of the story. 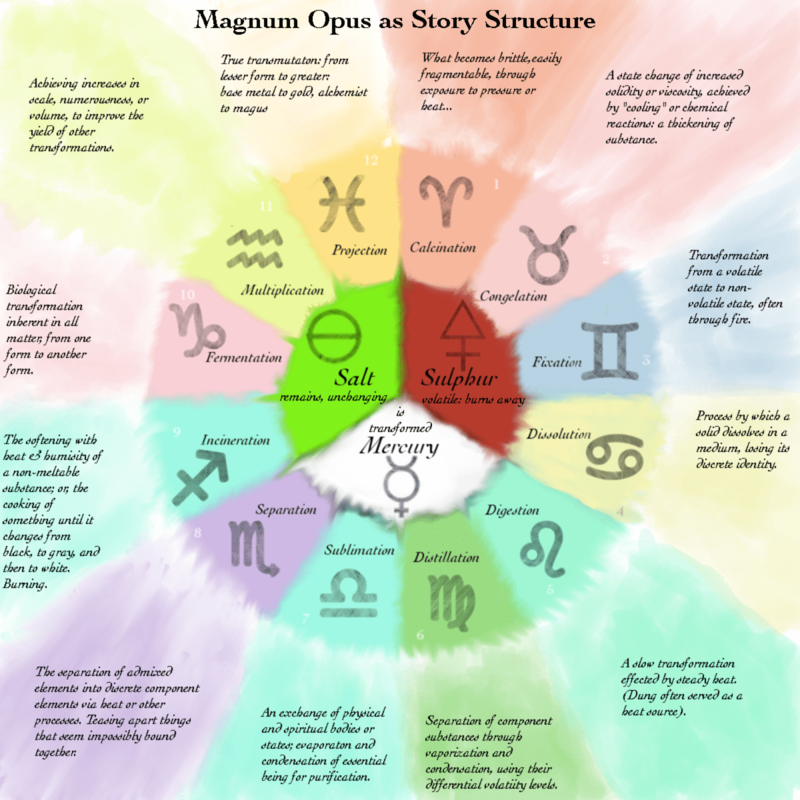 Stories are widely read as, and understood to be about, the process of transformation that a character or group of characters undergo in the course of a process usually involving increasing pressure and raised stakes–rather like the heating of metals in an alchemical ritual or experiment. What in the character is to be “burnt away” through the experiences of the story. What in the character is to remain the same, because its durability and fundamentality ensures that it cannot be burnt away. What in the character is, instead of burning away or enduring, is purified through transmutation from one form to another (typically, from a baser form to a more precious form). I can’t help but observe that characters seem to start consistently possessing this triune nature, dynamically affected by the power and pressures of plot, in Renaissance literature, which was the heyday of alchemy’s popularity in European cultures. Your average literature student reads Chaucer and finds characters flat and static, not changing much; but then proceeds to Renaissance literature (especially Shakespeare) and finds character development central. There has of course been plenty of critical attention directed toward alchemy in specific texts where it is implicit or explicit–Shakespeare’s The Tempest, or Jonson’s The Alchemist–but I’m not sure this observation has been floated before. I am indeed very curious about whether this triune nature of all matter suggested by Paracelsus was one that gained popularity in the literary world, since the parallel seems so strong. And, really, there’s a kind of allure to the whole idea of author-as-alchemist, performing a kind of magical transformation of characters–and of the audience, too, subtly–through the act of a narrative process that parallels the alchemical process outlined in the magnum opus, that “great work” through which the Philosopher’s Stone was to be created. Innocence/Naïveté, which is to be “burnt” away through the vicissitudes of plot. Curiosity, the drive to understand the world, which remains because it is fundamental to the character. A hunger for power for its own sake, transmuted through the experiences of the plot into a hunger for power to be used for some greater purpose. Obviously, that’s a very simple example, suited to a short story. Longer works would probably necessitate whole sets of traits–complexly interacting–in each category, and perhaps a more nuanced set of specific plot processes, perhaps drawing upon the classic list of alchemical processes necessary to complete the magnum opus . 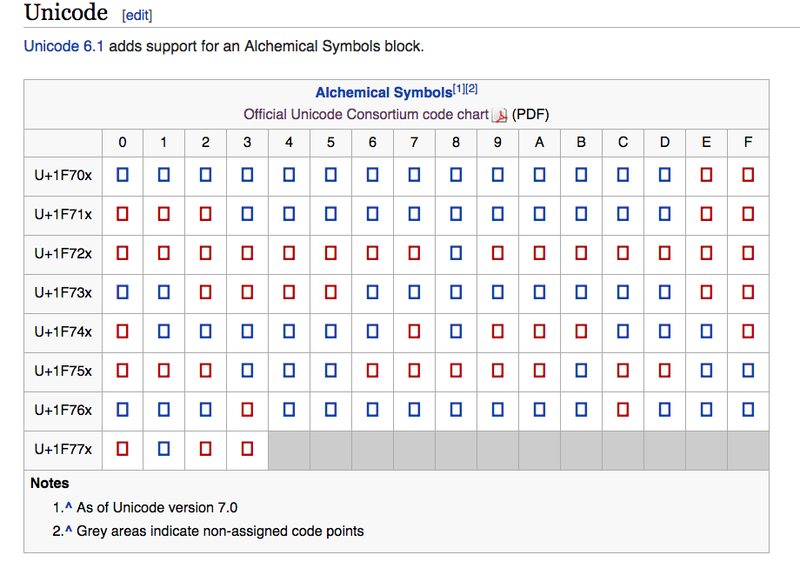 (Screenshot from Wikipedia below, as I’d rather not download all the symbols and upload them here.) The attentive reader will recall that for Paracelsus, “Separation” was the crucial process, but it’s only one kind of process, and each of these could easily be understood to represent a certain kind of transformative process, whether applied to a single character along his or her transformation, or applied to different characters in ways that contrast one another. It’s rough (the colors are all wrong, for one thing), but it gets the idea across. The inner ring of elements is character traits–the component elements essential to a given character–and the outer ring are the twelve alchemical processes from the classic “magnum opus” through which the making of Philosopher’s Stone was achieved. Those processes (of transformation, naturally) are labeled with their related “zodiac” sign mostly just because it looks pretty. But in terms of what you do with each type of transformations, you can read the term–distillation, separation, incineration, etc–literally, or you can look at what each process meant within alchemical practice, to get some ideas about plot processes that could act upon a character. Some of the terms can also be fruitfully understood in terms of other pertinent meanings those words have acquired in English since the days of Paracelsus, such as in psychoanalysis (sublimation and fixation come to mind). Either way, it should help you develop a fruitful set of differing plot processes, either acting upon the same character or group of characters, or upon different individuals, as you prefer. While the Magnum Opus was a cumulative set of twelve steps–an alchemical “twelve-step program,” yes, and I’ve numbered the transformations accordingly on the chart–there’s no reason they have to occur in order, or all have to occur in a given story, though there is something exciting about the challenge of fitting in all twelve types of transformative processes. The freedom here translates to a kind of flexibility, and to a greater degree of creativity than the formulaic and now very recognizable Hero’s Journey model that so many writers seem to use. This model also brings character development (transformation) to center stage, which can’t hurt any. I will suggest, however, that there’s little point in considering the character in terms of less than all three of the essential tria prima: what gets burnt away, what stays and cannot be destroyed, and what is transformed to a truer and more refined version of what it was at the beginning. This seems like an immensely useful formulation of character development, in contrast to the usual formulation I’ve seen elsewhere, mostly focused on a vague notion of necessary change that either occurs or is resisted. By the way, it doesn’t necessarily have to be all that conscious. Thinking over my own book-in-progress, I can easily think of examples of most of these kinds of transformations, which different characters are undergoing, often in parallel to one another–one character fixating, while another sublimates, and a third undergoes a slow fermentative development. Maybe this is familiar ground that has been covered before by someone… I don’t know. But it seems new to me, and, well… an interesting alternative to the (now-tired) Hero’s Journey structure. I’d be curious to hear back if anyone tries working more with this notion, in any case. For my purposes, it’ll be more of a handy widget and a thinking tool than any sort of story cranking machine, but I’m sure others could find wonderful uses for it. 1. This is probably more pertinent to longer forms of narrative, than shorter ones. For short stories, this would serve more as a kind of taxonomy of transformative processes. For longer works, it’s more of a pool of possible transformative processes. 2. I think trying to fit all twelve of the forms of transformation from the Magnum Opus into one character’s arc even in a novel is probably,well… probably not a great idea. Maybe if one were writing a series of novels, it might work. 3. One thing I’m interested in is the structure of comparative transformations: multiple characters in comparable situations who end up undergoing different transformations, and obtain different results. For example, one could argue the primary transformations of the leading young men in Hamlet are singular: Fortinbras is “sublimated” or “projected” into avenging heroism; Laertes’ rage is “distilled” into a more sordid and treacherous revenge that ends up spelling his own doom; and Hamlet’s, resisting transformation, is “fixated” at the level of doubt and unceasing inquiry for so long it destroys him. Which is to say, probably one form of transformation is sufficient for a supporting character arc, and likely one form of transformation is going to dominate the arc of even main characters. A really interesting metaphorical system – which autocorrect perhaps fittingly wanted to make a metallurgical system. I feel like I have to go back and re read John Crowley’s Aegypt novels again. Of there’s anyone I feel would have been all over this, it’s him. Glad you find it interesting! As for Crowley, interesting. I’m currently listening to the audiobook version of Little, Big, though to be honest I’m not really crazy about it so far. Interesting. I generally use astrology as a character development tool, in the sense of “developing” (i.e. fleshing out) a static image of a character at a single point in the story. Good tool because there are lots of planets/variables involved, so it helps me come up with a picture more complex than what I can devise on my own. However, I have no tool to assist me in the other sense of “developing”: that is, advancing and progressing. This may just be the ticket to developing the kind of character-driven plot I’ve always wanted to write but could never come up with on my own. One question: do the zodiac signs correspond at all to each stage the symbols stand for? I ask because I’m having trouble grasping what makes each stage unique as well as the logic behind their sequential flow. I have a clear picture of the zodiac in my head, however, and I was wondering if understanding one might help me get a grasp on the other. Yeah, the astrology thing and this alchemical notion both have that in common, the virtue of pushing one to use more ingredients in the stew than one might otherwise do. (Like the Fiasco-based exercise earlier in this series.) If you were to apply the astrology thing to character development, I suppose it’d be about choosing fundamental traits and having characters either turn sow’s ears into silk purses, or unlearn certain tendencies, or have characters “switch” from one sign to another, or something. The zodiac symbols were explicitly used to correspond to each step of the magnum opus, but what I’ve read is that that had as much to do with cryptography as anything else: since alchemists guarded many of their secrets from the non-initiated for a long time–until Books of Secrets started to make them public, and beyond–it was a handy set of twelve ordered steps available for encryption. I don’t think there’s necessarily any symbolic meaning for the specific signs in relation to the step. Oh, and as for what makes the stages unique, and the logic of their sequential flow, that’s all chemical in nature, I think. As I say in the updated comments, I think it would be hard to apply them as a 12-step series of stages for a single character. For me, the most notable writer to be influenced by alchemy was Shakespeare (he makes it explicit in a few places, including The Tempest), and what he excels at is comparative transformations: three different characters in a similar position react in different ways, which brings about different results and transformations in their person. Additionally, I’m pretty sure ASCII characters exist for all the zodiac symbols.